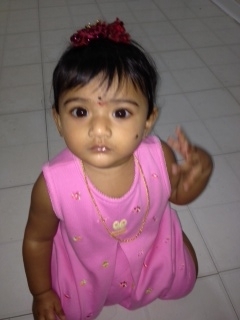 An AMBER ALERT has been issued for missing 10 month old baby, Saanvi Venna. The infant was abducted from an Uper Merion, PA apartment after her grand mother was murdered. The murder victim’s son, Venkata Konda Siva Venna, found the body of 61 year old Satyavathi Venna who was visiting from India, realized his daughter was missing. It is not yet known if the murder of the grandmother was a random attack or if police have a suspect. Police described Venna as an Asian-Indian female, standing 2-foot-6 and weighing 21 pounds, with black hair and brown eyes. She was last seen wearing a white dress with pink flowers and wearing unknown jewelry. Local, state and federal authorities are working together to search for a missing 10-month-old infant taken from an Upper Merion apartment after her grandmother was killed. Investigators have identified the dead woman as Satyavathi Venna, 61, who was visiting her family from India. The infant, Saanvi Venna, was abducted from the Marquis Apartment complex on the 200 block of West Dekalb Pike in King of Prussia some time between 8 a.m. and 1 p.m. on Monday. The infant’s father spoke Monday night during a press conference. The FBI has joined the search for missing 10 month old Saanvi Venna. It has now emerged that FBI agents are involved in the investigation to find Saanvi. Investigators handed out fliers outside the family’s apartment Tuesday. They urged tipsters to call Upper Merion police at 610-265-3232 or Montgomery County Detectives at 610-278-3368. For more updates, to discuss the case and read what others are saying, go to Scared Monkeys Missing Persons Forum: Saanvi Venna. UPDATE I: Missing infant Saani Venna found dead in Pennsylvania, family friend arrested. Authorities recovered the body of a 10-month-old girl not far from where her grandmother was slain and arrested a family friend who investigators said killed them in a botched ransom kidnapping. Saanvi Venna’s body was found around 4:30 a.m. Friday in the basement of a building in the same Upper Merion Township apartment complex where she lived. Investigators had been searching for her since Monday.